US Dollar: March USD is Up at 96.290. Energies: March '19 Crude is Down at 53.85. Financials: The Mar 30 year bond is Up 5 ticks and trading at 145.26. 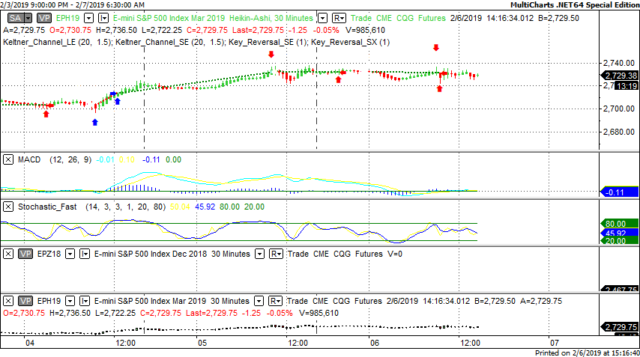 Indices: The Mar S&P 500 emini ES contract is 22 ticks Lower and trading at 2724.00. Gold: The Feb Gold contract is trading Down at 1308.20. Gold is 62 ticks Lower than its close. This is not a correlated market. The dollar is Up+ and Crude is Down- which is normal and the 30 year Bond is trading Higher. The Financials should always correlate with the US dollar such that if the dollar is lower then bonds should follow and vice-versa. The S&P is Lower and Crude is trading Lower which is not correlated. Gold is trading Lower which is correlated with the US dollar trading Higher. I tend to believe that Gold has an inverse relationship with the US Dollar as when the US Dollar is down, Gold tends to rise in value and vice-versa. Think of it as a seesaw, when one is up the other should be down. I point this out to you to make you aware that when we don't have a correlated market, it means something is wrong. As traders you need to be aware of this and proceed with your eyes wide open. At this hour Asia is trading Higher with the exception of the Nikkei exchange which is trading Lower at this time. Currently all of Europe is trading Lower at this time with the exception of the London exchange which is fractionally Higher at this time. Unemployment Claims is out at 8:30 AM EST. This is major. FOMC Member Clarida Speaksat 9:30 AM EST. This is major. Natural Gas Storageis out at 10:30 AM EST. This is major. 30-y Bond Auction starts at 1 PM EST. Major. Consumer Credit m/m is out at 3 PM. Major. 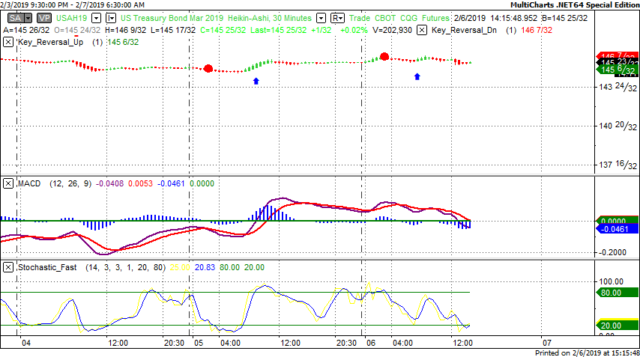 Yesterday we gave the markets a Downside bias as both the USD and the Bonds were trading Higher yesterday morning and that doesn't bode well for an Upside hence the Downside bias. The markets didn't disappoint as the Dow dropped 21 points and the other indices lost ground as well. Today we aren't dealing with a correlated market and our bias is to the Downside. Yesterday we might have thought that the markets might move Higher as President Trump's State of the Union Address was mild compared to some of his tweets. That wasn't the case yesterday morning as by our rules we felt the markets would go Lower and they did. Today we have Unemployment Claims, an FOMC member speaking and Consumer Credit at 3 PM EST. These are all major and proven market movers, so time will tell how it all works out. As readers are probably aware I don't trade equities. While we're on this discussion, let's define what is meant by a good earnings report. A company must exceed their prior quarter's earnings per share and must provide excellent forward guidance. Any falloff between earning per share or forward guidance will not bode well for the company's shares. This is one of the reasons I don't trade equities but prefer futures. There is no earnings reports with futures and we don't have to be concerned about lawsuits, scandals, malfeasance, etc. Anytime the market isn't correlated it's giving you a clue that something isn't right and you should proceed with caution. Today our bias is to the Downside. Could this change? Of course. In a volatile market anything can happen. We'll have to monitor and see. As I write this the crude markets are Lower and the S&P is Lower. This is not normal. Crude and the markets are now reverse correlated such that when the markets are rising, crude drops and vice-versa. Yesterday March crude dropped to a low of $53.00. It would appear at the present time that crude has support at $53.00 a barrel and resistance at $55.00. Remember that crude is the only commodity that is reflected immediately at the gas pump. Please note that the front month for crude is now March. Last month OPEC met once again to cut production but the price of crude is starting to climb. The question is if whether this is temporary or something more permanent. Crude oil is trading Lower and the S&P is Lower. This is not normal. Crude typically makes 3 major moves (long or short) during the course of any trading day: around 9 AM EST, 11 AM EST and 2 PM EST when the crude market closes. If crude makes major moves around those time frames, then this would suggest normal trending, if not it would suggest that something is not quite right. As always watch and monitor your order flow as anything can happen in this market. This is why monitoring order flow in today's market is crucial. We as traders are faced with numerous challenges that we didn't have a few short years ago. High Frequency Trading is one of them. I'm not an advocate of scalping however in a market as volatile as this scalping is an alternative to trend trading. Remember that without knowledge of order flow we as traders are risking our hard earned capital and the Smart Money will have no issue taking it from us. Regardless of whatever platform you use for trading purposes you need to make sure it's monitoring order flow. Sceeto does an excellent job at this. To fully capitalize on this newsletter it is important that the reader understand how the various market correlate. More on this in subsequent editions. Nick Mastrandrea is the author of Market Tea Leaves. Market Tea Leaves is a free, daily newsletter that discuses and teaches market correlation. Market Tea Leaves is published daily, pre-market in the United States and can be viewed at www.markettealeaves.com Feel free to visit and subscribe.